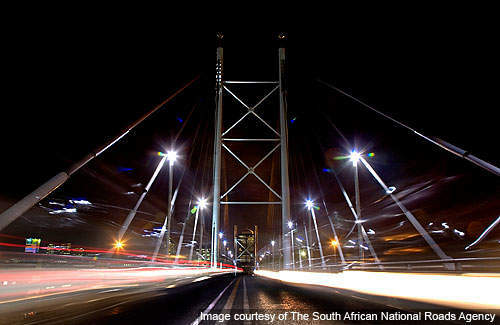 Nelson Mandela Bridge is the largest cable-stayed bridge in South Africa. The Nelson Mandela Bridge carries two traffic lanes. The pylon shafts are circular in shape with a diameter of 1.35m. The deck structure is constructed with composite steel-reinforced concrete. 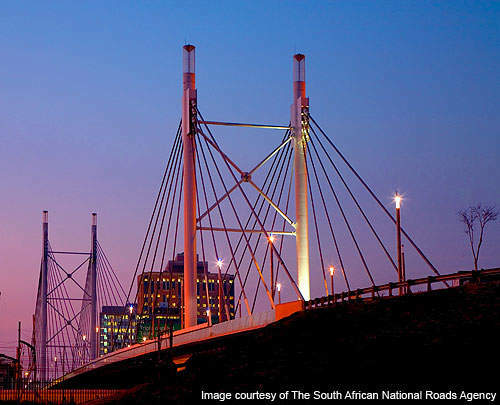 The Nelson Mandela Bridge in Johannesburg is the largest cable-stayed bridge in South Africa. 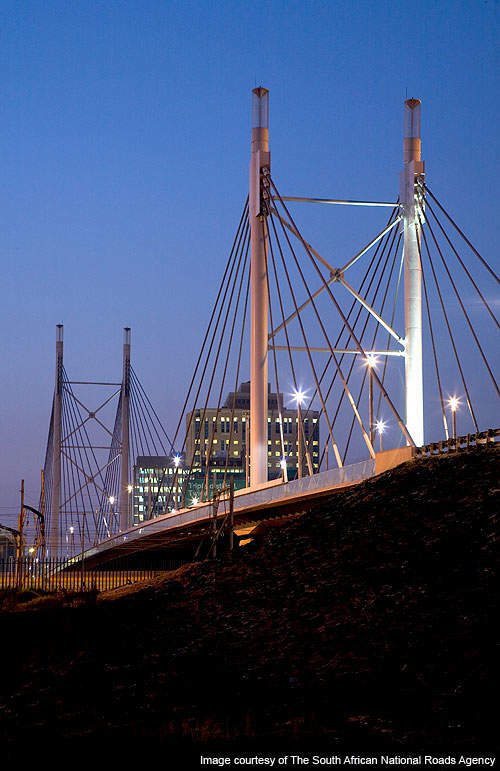 The 284m-long bridge connects two significant business areas: Braamfontein and Newtown. The bridge starts at the end of Jan Smuts Avenue and links Braamfontein at Constitutional Hill and Newtown in the heart of the city. 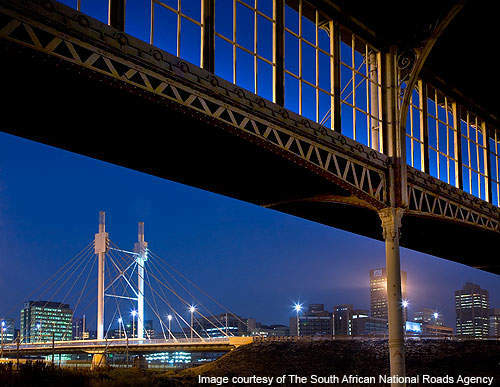 The bridge project was proposed to restore and modernise the inner city of Johannesburg. The design was completed in 2001 and the ground breaking event took place in September 2001. Construction of the bridge took approximately two years to be fully completed in July 2003. The construction was initiated by Blue IQ Investment Holdings, which invests in infrastructure projects. The bridge was built over 42 railway lines without disturbing railway traffic. It crosses the tracks of Johannesburg railway station and extends to Newtown, carrying both road and pedestrian traffic. The total cost of the bridge was estimated at R120m. The final design of the bridge posed security problems and was therefore revised. The bridge was constructed to have a light structure by using structural steel with a concrete composite deck. The 176m-long bridge carries two traffic lanes, a bicycle path and two pedestrian walkways, each 1.5m wide. The walkways feature continuous glass parapet for the safety of pedestrians. Steel brackets support the walkways. The pylons, which act as balancing structures to the bridge, were constructed asymmetrically due to the presence of railway tracks. Only two locations were found feasible for constructing the pylon, one in the north and the other in the south. The northern pylon is 42m high and the southern one is 27m high. These pylons are made of lateral bracing and are set up on cone shaped concrete pier structures. The pylon shafts are circular in shape with a diameter of 1.35m. The space available for accessing the ramps was limited; hence the deck of the bridge being so narrow. The deck structure is constructed with composite steel-reinforced concrete. It is composed of two longitudinal steel box beams on either side and a concrete slab supported by a cross beam at intervals of 4m. The interior surfaces of the steel box beams are unpainted and are protected against humidity. The bridge structure is supported by large pot bearings of 1.5m diameter. These bearings are designed to suit movements of the bridge at high temperatures. Expansion joints are created at the abutment areas of the bridge. Steel pendulums are used to accommodate the displacement due to temperature fluctuations at the deck, and the abutment. The stay cables of the bridge are 15mm in diameter. They were supplied by Haggie Wire and Strand and Marley Pipe Systems. The installation and stressing of the cables was performed by Amsteele Systems / Steeledale Fixing Systems. Construction of the bridge required 4,000m³ of concrete and 1,000t of structural steel. In addition, 500t of reinforcing steel was cast into the concrete for reinforcement. The construction was carried out by the South African National Roads Agency. The main contractor was Grinaker LTA. The bridge design contract was awarded to Denmark-based Dissing + Weitling in 2001. The co-contractors for the project were Bafokeng Civil Works and Grinaker-LTA. Patrick Rimoux was involved in electrical reticulation and architectural theme lighting. ARQ Consulting Engineers and BKS managed structural engineering. The sub-consultants of the project were Denmark-based COWI Consulting Engineers and Planners, and South Africa-based PD Naidoo & Associates (PDNA). PDNA was also involved in the design team.